KV-63 is located in the Valley of the Kings approximately 14.5 meters from the south edge of KV-62, the Tomb of Tutankhamun. Dr. Zahi Hawass officially announced our newly discovered tomb, KV-63 on 10 February 2006. However, the initial shaft was discovered a few days before the end of our 2005 season. KV-63 is the first tomb to be discovered in the Valley of the Kings since 1922. Roxanne and Bill Wilson have financed and maintained the KV-63 website since 2006 and will continue to do so into the future. We are honored to perpetuate this historical event and record of the KV-63 discovery and the efforts made by many dedicated individuals. It is with great sadness that we announce the passing of Dr. Otto Schaden on November 23, 2015. ..........his memory will live on as long as we speak his name. As 2009 is rapidly drawing to a close, we are in process of making the final plans for the season of 2010. The season will officially get started in early January and run past the middle of March. There is no more excavation to conduct in KV-63 and during the past season earlier this year, the remaining sealed storage jars were opened and examined. Thus, we can claim that the excavations for KV-63 are complete. What remains, however, consists of more study and resin removal from the coffins, plus some specialized studies on a variety of the finds. As we are now in a �study season� mode, we will have a smaller staff. More details on the coming season will be in the next KV-63 Update which we hope to send out to staff and sponsors before the end of this calendar tear. The web site will have extracts from the KV-63 Updates which are issued at intervals during the season. The report (for the Annales du service des Antiquites de l�Egypte) was submitted some time ago and now we await news from the Supreme Council of Antiquities (SCA) on our proposal for the renewal of the concession and the supporting security documentation. The costs of travel, hotels and other needs is considerable, therefore we urge prospective donors to check our DONOR�S PAGE on our web site. A Paypal link has recently been added to make Domestic and International donations easier. USA Donations are tax-exempt. The symposium was hosted by Dr. Zahi Hawass and the Supreme Council of Antiquities (SCA). There were several days of activities, but the main events took place on November 4th, the 87th anniversary of Howard Carter�s discovery of the tomb of Tutankhamun (KV-62). The day�s program was divided into several parts: a series of lectures in the morning was continued in the early evening by many of those archaeologists and Egyptologists who have conducted studies in the KV. In the middle of the day, the scene shifted to the West Bank of the Nile where there was a luncheon by the old Howard Carter House. The House, in more recent times has been used by inspectors and now it will become a full-fledged museum honoring Carter�s works in the Valley, the highlight being his discovery of the virtually intact tomb of Tutankhamun (KV-62) in 1922. Zahi Hawass led off the lecture program in the east bank�s Mummification Museum auditorium with a report on the SCA�s ongoing work in the KV. In addition to exposing the huts found by Carter in the very center of the Valley, excavations near Merneptah�s KV-8 revealed some ancient trenching for flood control. In the areas investigated, many ostraca and ceramics were found. Geoffrey Martin (Cambridge University) followed with a report on the clearance of Horemheb�s royal tomb (KV-57). That tomb; as was the case with many monuments, was found by Theodore Davis, but the well chamber and some back rooms had never been fully cleared. Ostraca found suggest that Horemheb�s reign may have been but only ca. 14 years, not the 27 years sometimes credited to him. I had the honor of following third on the program. Inasmuch as I have given a number of reports on the recently discovered KV-63, my plan was to summarize how I got involved with the royal valleys, followed by a brief summary of the various tombs associated with my projects in the West Valley (Nos. 23, 24 and 25) and in the main Valley of the Kings (Nos. 10 and 63). Earl Ertman (Akron University) submitted a title (�Selective Figurative Ostraca from the Area of the Amenmesse Project, Valley of the Kings�), but was unable to attend the conference. Salima Ikram (American University in Cairo) kindly read Earl�s paper. Salima had the distinction of clearing all of the large storage jars found in KV-63. She also presented a paper on �Princes and Pets: Animal Mummies in the Valley of the Kings.� Among the items illustrated in her presentation was a shrew bundle found in KV-10. With the discovery of Tutankhamun�s tomb in 1922, the series of numbered tombs came to standstill until KV-63 was found in 2005. As many of the conference speaker�s noted, the long list of tombs noted through 1922 did not signify the end of the story. Most of the work in the royal valleys since 1922 has consisted of a variety of projects from restorations, epigraphic work and tomb clearances--mostly associated with the known monuments. New techniques and a second (or third) look at the monuments and objects can and still do allow new information to be gained. The Valley of the Kings reveals its mysteries slowly. There were 83 years separating the discoveries of KV-62 and KV-63, but it may not take another fourscore years before KV-64 appears. The luncheon at the Carter House included a tour of the building and a dinner. Zahi Hawass made an address and the 8th Earl of Carnarvon also made a speech. The 5th Earl of Carnarvon was Carter�s benefactor; it must be an item of great pride and satisfaction to have this history in one�s family background. In a short time I will be leaving for Cairo (New Year�s Eve). I plan to meet with the recently appointed Director of the Permanent Committee and of Foreign Missions, Dr. Mohammed Ismail Khaled on January 3rd, and then hope to reach Luxor by the following morning. I will then make the necessary arrangements to have KV-10 opened. There will be a Karnak Symposium going on at that time, so I will try to attend some of those lecture�s as I unpack, get settled in the hotel and prepare for the opening of KV-10 and the start of the season�s work. My hope is that we can get started in the Valley on or about January 7th. and below the Oct. 4th Update�..A Special Commentary on the Menkheperre Seal by Dr. Otto Schaden. A mud seal bearing the cartouche of Menkheperre (Thutmosis III). During this past spring and summer, a variety of reports on our work have become available in recent issues of KMT and our report on the 2006 season appeared in ASAE 82 (2008), pp. 231-260. A report on the 2009 has recently been submitted for publication in ASAE. A discussion of the discovery of KV-63 will be included in the catalogue for an art show featuring the work of Sue Osgood (cf. below). Finally, a summary of the last season was also sent to Orientalia. With some of the immediate publications now completed, the proposal and security documentation for the 2010 season is the next order of business. The SCA requires this preliminary paperwork to be submitted several months before the proposed starting work date. Just a few days ago, a FEDEX packet with the proposal and security papers was sent to Dr. Mohammed Ismael Khaled, recently appointed director of the SCA�s Foreign Missions office. While the SCA processes our papers, we will work on schedules and budgets. Funding will be a key item this season. Almost all of the funds at hand are surplus from last season. Our hotel costs were such that we were able to support the large staff and still have some funds remaining. We will have a much smaller staff in 2010 now that we are fully in a �study season� mode --- continuing work of the coffins and also some very specialized studies and tasks associated with ceramics, the unbaked clay trays, impressions, samples (for testing) and the like. In our various reports, we have tried to convey the wide range and quantity of the artifacts which were stashed into this small single chambered tomb. Even with a reduced staff, we will have need for a small gang of local workmen led by our reis, Nubi abd el-Basit. In addition to the foreign staff, we will have need of some SCA conservators. Our present surplus funds will cover many of our needs, but we issue this call in the hopes of raising some additional funds before the end of this calendar year. Bill Petty (Museum Tours, Inc. and Petty Foundation) will accept tax-exempt donations; please see our web site�s donation page for details. The SCA will be hosting a conference on �The Valley of the Kings Since Carter� in Luxor during early November of this year. The meetings are to coincide with the anniversary of Howard Carter�s discovery of Tutankhamun�s tomb (KV-62) in 1922. As my projects have touched of WV-23 (Ay), WV-24, WV-25, KV-10 (Amenmesse) and KV-63, my aim is to present some commentary of the aims and results associated with these tombs. My presentation will be entitled �The West Valley and Amenmesse Projects (1971-2009).� Though we cleared WV-23 in 1972, it was in 1971 that I had rubble removed from the entranceway so that its interior could be examined in order to make some reasonable estimates for a possible clearance in the future. Happy to relate that future date materialized quickly. For that SCA conference, Earl Ertman will present a paper entitled �Select Figurative Ostraca from the area of Amenmesse Project, Valley of the Kings.� Salima Ikram�s lecture will be on �Princes and Pets: Animal Mummies in the Valley of the Kings.� Salima has examined the animal remains from our projects and has done likewise for other KV missions. �84 Years After Tutankhamun: The Latest Discovery in the Valley of the Kings and the Egyptological Art of Susan Osgood� is the title for an art show which will be exhibited in Germany. Thanks to the generosity of Ray Johnson, director of the Oriental Institute�s Epigraphic Survey, Sue was able to work with our mission in 2006 and 2009, thus her show will feature her work on the KV-63 coffins along with examples of her work with the Chicago House mission. The show will appear at the Egyptian Museum of the University of Bonn from 26 November through to next June, than it will be shown at The Museum August Kestner in Hanover, Germany from July 15, 2010 until October 2010. Please see http://www.susanosgood.com/ for additional details or under the KV-63 Exhibit Tab. For the remaining months of 2009, we will concentrate on that KV conference and then on schedules and budget considerations for the 2010 season. As our plans are worked out, we will try to issue at least one more Update after the KV conference is over and we have pretty much worked out schedules for the upcoming 2010 season. A mud seal bearing the impression of a cartouche of Menkheperre (Thutmosis III) was found in Pot 3 in March of 2006. *A photo of the seal can be found under the 'Photos ~ 2009' tab. The appearance of a Thutmose III cartouche is, we believe, the result of the use of his famous name on scarabs and seals well beyond his actual period of reign. Late era kings and the Ptolemies were still adding Thutmosis III's images to the walls of Karnak Temple! The first two are possible, for we did have a Menkheperre impression in the tomb shaft, and in mixed fill over the East Huts we did have mention of Thutmosis IV on an undated ostracon. The materials in KV-63 could fall into Horemheb's era, but we would expect a djeser sign if Horemheb's name was intended here. Tutankhamun or Ay (see above) would fit best with the ceramics and other materials found in KV-63. As Tut was followed by Ay, our general dating as "Tut era, give or take a few years" would allow for the restoration of Ay's prenomen here. The bottom part of the seal is lost. The mud can be fragile and may have disintegrated a long time ago. The shaft, chamber and the storage jars have all been cleared, so there is no chance of finding the missing lower portion of this seal impression. KV10/KV-63�s 2009 Season officially ended March 24th. As always�. time proved too short to accomplish all we had planned to get done, but in spite of that the season was quite fruitful. The final weeks of the season were partially devoted to selecting and packing crates for shipment to the SCA magazine (storage building) near Howard Carter�s House. Five boxes of materials were delivered to the magazine on March 23rd. On that same morning, the wooden bed was moved to the Mummification Museum for impending display. The following day, March 24th, KV-10 and KV-63 were locked and sealed, signaling the end of the season. Afterwards, there was some last minute packing to attend to and the post-season report to prepare. On the evening of March 28th, Archie Chubb and I left for Cairo. The next morning I met with Dr. Magdy el Ghandour, Director of Foreign Missions, to deliver copies of the season report + CD�s and late that morning met with Dr. Zahi Hawass. A few days later I was back home in cold and windy Chicago. The study of the storage jars was completed during the earlier half of this season which added many extraordinary artifacts to our collection of materials. Our tally of natron from the jars and coffins surpassed the 400+ kilo mark (over 1,000 lbs.). The most interesting artifact was the wooden bed, broken into many fragments and stuffed into Jar #13. In March, the SCA officials decided the bed should go to the Mummification Museum in Luxor. It was crated and delivered to the museum on March 23rd. The museum director, Mohammed Yakia Ewada has already put the bed on public display. Meanwhile, Earl Ertman (correction) has prepared a article on KV-63�s Wooden Bed which is slated to appear in the next issue of KMT magazine. Later this summer, a more in-depth article by Roxanne on KV-63 Update: the 2009 Season will appear in the June/July issue of Ancient Egypt magazine. As mentioned in the last update, Coffin A�s fragments proved to be quite interesting. Though very fragmentary and fragile because of termite damage, some key texts could be recovered from under the resin coating�.the title �Royal Nurse� ( mn�t nsw ) and the name �Iny�. The longest translatable connected text was on the top cross band, left side: �Revered, (may) I see Re in the sky and drink water from the pool [ � ].� Conspicuous by its absence, the deceased is never identified as �Osiris� and the usual deities are not cited. The one example (quoted above) where we have the usual �revered� there is no qualification such as �revered by Anubis� etc. This lack of the traditional deities strongly suggests that this coffin was probably fashioned during the reign of Akhenaton when many of the traditional deities were abandoned. The rather high station held by the Royal Nurse Iny is reflected by some of the details of the coffin�s decoration. Some signs are inlaid, but most of the inlays are now gone. Some glass is used on the face mask and some border columns (a few still in situ ) have thin (1 mm) blue glass rod inlays. Finally, some surviving gold leaf further attests to the once opulent condition of this coffin. Lest we are fortunate to find some other evidence (in 2010) of this Royal Nurse, Iny, we can only speculate as to the specific nature of her position and duties. As a royal nurse, there are many potential candidates among the Amarna family and their inner circle of confidants. How it came about that her coffin was eventually used as a refuse bin in KV-63 would make a fascinating story. The general dating of the tomb previously reported still remains valid. Tomb KV-63 was most likely hewn during the time of Amenophis III. There is no evidence of a burial but the embalming materials were introduced during several intrusions late in Dynasty XVIII. This occurred during or very close to the time of Tutankhamun. Each coffin will be �dated� independently based on style, decoration, texts, i.e. Coffin E is very similar to some coffins from the Amenophis III era, whereas Coffin A shows signs which suggest the Akhenaton era. More details will be forthcoming on the remaining coffins. Like many others, Dr. Zahi Hawass asked when we would return to Luxor. It may still be too premature to say for certain, but I anticipate in early 2010. For now, there are many reports, notebooks, accounts, lectures, and fundraising to do. In addition, to preparing two articles; one for ASAE 82 (2009) and one for the Fall issue of KMT. For the immediate future�.the third KV-63 special, Egypt�s Mystery Chamber, is due to air on 26 April on the Discovery�s Science Channel (by Atlantic Productions). The broadcast will focus on the coffin texts, the wooden bed and the opening of some of the storage jars from this season. Again, thank you for your support and charitable donations �.for even the smallest contribution helps to keep our mission operating each year. Sunday, 26 April at 3:30 P.M. Presented by the Chicago Archaeological Society. Sorry for the delay, for I had intended to have this update out much earlier. My lecture on March 14th at the Mummification Museum went well as I managed to present sixty-eight images in 45 minutes! As mentioned in my 7 February update we discovered a very unique wooden bed inside Jar #13. In addition to finding the bed in the jar we also found three wooden boards (wrapped in linen) with 4 �prongs� or �legs� which may have served as supports for the bed. We now have enough such �legs� for four bed supports, but only 3 wrapped boards (ca. 50 cm in length) have been uncovered. During a brief visit to KV-10/KV-63 on March 1st by Dr. Zahi Hawass, he called attention to one of our SCA conservators, Amany Nashed, for her good work on the restoration of the bed. Dr. Hawass also suggested we try placing the bed on the supports--- which we did the following day and they appear to be a good fit. The KV-63 website already has a few images of the bed and supports posted (*plus some new ones added today) but more images will be made available soon. As we are currently copying the texts, we must address the order of the decoration, for traces on the front vertical column do not indicate that Henut-wadjbu�s name was ever present there but it does appear on the cross bands and end panel. For example, if the coffin was originally decorated for this lady, why are the erasures only on the front column? Or, if the coffin was initally decorated for Henut-wadjbu, then why weren�t her names erased from the cross bands and end panels? Furthermore, the vertical column of text down the center of the lid has been thoroughly erased. But on the front of the �toe� section (footboard) one single hieroglyph remains --- a seated man --- the determinative for a man, indicating that the coffin was at one time inscribed for a male. A few days ago our conservators began removing resin from the lid fragments of Coffin B and the poorly preserved sides of Coffin A�s box - where we have discovered some very interesting texts! After further cleaning we will send a report to Dr. Zahi Hawass and later provide more details in our next Update. In regards to our staff, Conservator Margot Wright has been working on the floral garlands/collars and the beds �legs�. Artist Sue Osgood (on loan from Chicago House/ORINST) has been drawing Coffins D, G and Coffin B�s mask while Pieter Collet completed the mapping of KV-63 and drew the lion-headed bed. Two recent additions to our team were SCA conservator Adel Aziz Andreus who worked with us in 2006 and SCA Inspector Ahmed Mahmoud Yassin who replaces Inspector Ezzat. Our season is rapidly drawing to a close, for we had set ca. March 21 for an initial shutdown date but I will allow a few extra days for last minute packing before I head to Cairo and then home. We will try to get in a final update from the field (or from Cairo) towards the end of this month. So stay tuned for more exciting news to come. This season, in addition to examining our tenth pillow (from Jar #13) and a multitude of other textiles from KV-63, I came upon one item of particular interest to report on. This object appears to be some kind of �rug or towel� found inside Coffin A in 2006. Although this item exhibits significant decomposition enough is salvageable to recognize its original intent and form. It is a �pile� textile, whereby extra strands or loops of thread were woven into the cloth or attached afterwards to project or stick out, to create a pile effect that gave the textile absorbent and isolating qualities (similar to our modern bathroom floor rugs). Other examples of this type of textile were found in the tomb of Kha (laid over a bed) at Deir el Medina, in a eleventh dynasty tomb at Deir el Bahari and in the mass�burial of soldiers in the same area. The actual size of the �rug� is unknown but probably measured at least one square meter judging by the amount of decay and surviving material. A few photos of this remarkable �find� have been made available, under �2009 ~ Photos�, courtesy of Elise van Rooij. Dr. Otto Schaden is scheduled to lecture at the Mummification Museum in Luxor on Saturday, March 14th at 7 P.M. The lecture will include some of the highlights of KV-63�s discoveries this year. NHK Television (Japan Broadcasting Corporation) filmed KV-63 on February 10, 2009 and interviewed Dr. Otto Schaden and Professor Earl Ertman. The network is in the process of filming four separate two-hour television specials � Pyramids, KV-63, Queen Hatshepsut and Cleopatra. The programs are scheduled to air in Japan in September with possible broadcast in the USA by October. On this similar note a new page entitled Media/Television has been added to the KV-63 website. Included in the upcoming broadcasts is a third installment on KV-63 by Atlantic Productions (affiliated in 2006 with Discovery Channel) slated to air later this year. Please check the KV-63 website for further details as dates become available. Also, watch for the upcoming article entitled KV-63�s 2009 Season written by Roxanne Wilson in the June/July 2009 issue of Ancient Egypt, The History, People and Culture of the Nile Valley magazine (UK). The team would also like to acknowledge some of our newly arrived staff members and consultants: Archie Chubb (photographer), Elise van Rooji (Textile Specialist), Maryann Marazzi (Photographer), Margot Wright (Conservator), Pieter Collet (Draftsman), and Sue Osgood (Artist). The long awaited update featuring descriptions and images of some of our most recent �finds� is finally here. Many thanks for your patience, as we have been quite busy. In January, as the conservation work began in earnest on the coffins, the KV-63 team also began opening some of the remaining storage jars. Jar number 13 was the first to be examined and proved to contain some of the most interesting items�. including a wooden bed. The bed had been broken into many pieces to fit inside the jar, but is now completely restored. The bed features the customary lion head decorations at the head end and the raised footboard on the other; its length is 170 cm. There are no �feet� to speak of, so it may have been used simply to hold a coffin or mummy �off� the ground during the embalming process. Some strange boards covered with linen and adorned with possible �feet� were also in Jar 13. When these items are conserved, we will see if they have any possible connection with the bed as supports. To add to the bedtime theme of the preceding paragraph, we also found an intact pillow (the 10th from KV-63). Though pushed in at one end from the confined space of the storage jar, it appears to be quite intact and in excellent condition. Among other finds are more miniature vessels, bowls with hieratic texts, linen, jar lids and reed tubes (containing a powdery substance). One of the jars emptied this season had what must be a whole storage jar within it --- in many fragments, of course. A rough estimate is that the tomb and coffins may have contained nearly forty of these large storage jars, all virtually identical to those found by Theodore Davis in KV-54. The new array of natron, natron bags, natron �noodles�, chaff and botanic materials add to the assemblage we collected in 2006. One new twist consisted of some small bowls tied with strips of cloth and filled with pigments. One is a dark brown powder, another black. One such bowl is labeled �sh3� which is described as a grain or mineral in the Berlin Dictionary. We will soon select and package samples in the hopes of submitting them for testing. More seal impressions and some wine jar stoppers (fragmentary) still leave us lacking a royal name but we are making some headway. There are six more storage jars to open and these will be done in mid February when Atlantic Productions is scheduled to come out and film a follow up to the program aired in 2006. Coffin G (Youth) has been carefully cleaned inside and out. Being the best preserved of the larger coffins, Coffin G gives us our best hope to recover some texts from under the resin. Within a few days, we hope to have the Coffin C fragments taken out so Earl Ertman can get a good look at both fragments of what maybe a distinctive face. During this past month, we have also begun photographing all of the KV-10 and �hut� ostraca in digital format. This should make for easier and quicker access to the ostraca inscriptions in the near future. In addition, pottery expert Dave Aston visited last week. Later, when all of the KV-63 wares have been drawn, we hope to have him out again for an extended stay. Staff Photographer, George Johnson has been busy photographing the collection in the Luxor Mummification Museum. KV10/KV63 Recorder Betty Schneider arrived a few days ago for a month�s stay. Later this week several of our earlier staff members will depart while new members will arrive to fill the void. Last, but not least, sincere thanks to Bill and Nancy Petty (Museum Tours) for facilitating our financing issues this season. This has already proved to be a most enjoyable and productive season. We have been busy opening jars, taking delivery of new bookcases for storage, chemicals for the conservators and making an inventory of some of our many locker boxes. The newly opened storage jars continue to bequeath some surprising objects! A report on some of our findings and images will be forthcoming soon. In addition to having Inspector Ezzat assigned to the mission, we also have a second Inspector, Abd El Nasser Mohamed Ahmed Saad. Conservator, Amany Email Nashed, also has some new help, Restorer Zaryf Alion Basyly and Saad Abd El Maugwd Abd El Hady. A short message today: We have begun to open a few of the remaining storage jars and have discovered some very �intriguing� objects. Our conservators are in the process of restoring some of these objects in addition to continuing their work on the resin covered coffins. We will unveil these wonderful new �finds� and a few photos of the artifacts after obtaining proper approval from Dr. Hawass. So don�t miss the next update! In the meantime, our staff continues to trickle in. So far we have Earl, George, Elaine, Roxanne, Heather, Salima, two SCA Inspectors and four egyptian workers. Dr. Otto Schaden safely arrived in Luxor and officially opened KV-10 and KV-63 on the 6th of January. In Otto's words....KV-10 (where everything is stored) is 'very dusty!' but the cleaning crew are already hard at work. Thus far, there is not much to report however we are happy to announce that Inspector Ezzat has been reassigned to us. For those of you who may not recall, Ezzat was the original SCA inspector assigned to us when KV-63 was discovered in February 2006. We are very glad to have him back. The rest of the team will begin to arrive by the end of this week. Servus! I am happy to report that our plans for the 2009 season has now been finalized. I will depart for Cairo on January 2nd. Factoring in a few days of scheduled meetings and retrieving supplies I should reach Luxor by January 5th. My hope is to open KV-10 and KV-63 around January 10th if not before. Staff will begin arriving January 9th with the rest of the team staggered over the months of February and March. It will be a full house this season as we expect close to 10 staff members along with three Conservators, two Botanists, one Textile specialist, a Draftsman and a Pottery Expert out this year. For us�.this should prove to be an exciting year as we search for answers to the many riddles that surround KV-63. So mark your calendars and look for the next update coming in early January. Sorry about the delay in getting out a new update for until recently I had little new information to offer. After six months of taking some new and costly medication, I was scheduled for a CT-scan early in July, followed by several doctors appointments to hear the results. Now after weeks of waiting, I am most pleased to report there is no indication of any return of the bleeding or growth which was removed back in January. As of now, I am scheduled to continue with my medication and blood tests for a few more months. If all goes well, it maybe possible to dispense with the medications soon and just have occasional check-ups. Plans will go forward for a winter season in the KV. As we are now affiliated with the SCA, we have had some correspondence with Dr. Zahi Hawass and Dr. Magdy el Ghandour, who have been brought up to date on my medical situation. Next, we will soon ask for some clarifications on the proposal and security issues. The proposal will essentially be the same as that submitted last year but with revised 'work dates.' The SCA generally suggests that proposals be submitted several months prior to the start of the proposed work dates. As I hope to arrive during December, we will propose the work dates to fall between early December and extend through April or later --- extensions are possible, but we try to have the span long enough to allow for any alterations in the schedule. For our staff, most will be needed in the early months of 2009 --- January, February and March. Once we get a general overview of staff, we shall see if we can suggest any adjustments as the aim is to have key positions covered throughout the season. While we simply use 'Amenmesse Project' in the heading above, this project includes the work on and in KV-10 and KV-63. The major emphasis will be the resumption of work on the artifacts from KV-63, including restoration and conservation work on the coffins, examinations of the sealed storage jars and special studies involving plant and textile remains. The amount of materials is considerable and it will be necessary to have an additional season after 2008/2009. As of now, we still do not know the extent of the contents of the remaining unopened storage jars. The contents of those jars will, in large measure, determine what specialists may have to be added next time. Now as the are about to get into the autumn we should see an increase in the appearance of these updates. We are looking forward to a successful season. Many thanks for your support and emails! By now�. many of you may have noticed the absence of regular updates from me concerning our 2008 season at KV-63. In January, with my departure to Egypt imminent, I elected to keep a routine doctors visit and was surprised to discover I needed emergency abdominal surgery to alleviate some chronic intestinal bleeding. Now post surgery�I should hasten to add that I feel much better. However, factoring in the required six weeks of recovery time and the evaluation of some new medication it was necessary to [again] revise my departure date for early March. Until a few days ago there was still a faint glimmer of hope that we might salvage a shortened season for March-April. Unfortunately, Murphy�s Law intervened, as there has been considerable delay in obtaining my medicine that prevents the recurrent bleeding. Therefore, with great reluctance, it is again necessary for me to postpone our 2008 season. Many close friends, colleagues, and KV-63 staff members have remained quiet about my surgery out of respect for my privacy. Therefore, I appreciate everyone�s kindness, understanding and sincere patience during this problematic period. A �special� thank you to Dr. Zahi Hawass and the SCA as they have been most understanding and sympathetic to the difficulties encountered in the quest to resume our work in the King�s Valley. Dear KV-63 fans, my departure date for Egypt has been revised for a possible early March departure. An exact date will be determined later this month reflecting the change in appointments and schedules. My departure date for Egypt is now slated for January 28th. I will spend a few days in Cairo meeting with the SCA officials before heading to Luxor. It is my aim to re-open KV-10 sometime in early February depending on the successful completion of necessary permits and other arrangements. KV-10/KV-63 staff, conservators and specialists will stagger their arrivals throughout February and March so we have adequate coverage for the various tasks and projects planned this season. Our daily routine will probably not vary much from past seasons although this year we will be in a study and conservation mode. It has been some time since my last update as many administrative issues necessitated my attention this summer. As of June 30th, our contractual agreement with the University of Memphis (UM) expired hence requiring a search for a new affiliate. Therefore, it gives me great pleasure to announce that the Amenmesse Project [KV-10 and KV-63] is now affiliated with the prestigious, Supreme Council of Antiquities (SCA) ~ The Egyptian Ministry of Culture. The SCA, as �Guardians of the Monuments� in Egypt require all missions to report directly to them for their approval and sanction. This amiable relationship has been the case during past seasons with KV-10 and during the clearance of KV-63, so this closer affiliation with the SCA should be beneficial to all concerned. With the exception of transferring the name of our affiliation, no other changes are expected. I will continue as Director of the mission and Earl Ertman as Associate Director. A few issues still remain unresolved but we are planning to resume our work in the King�s Valley this coming winter. My KV-63 Lectures to groups in California and Wisconsin were well received. In addition to the Wisconsin lecture and reception at the Kenosha Museum I also participated in a twenty minute interview on Kenosha Radio. According to Peter Chiappori, the museum was so swamped with calls following the radio interview that they had to move the location of the lecture to a bigger auditorium! Our latest news is that the SCA, Cairo will be meeting on our proposal in July. We hope to have more information for you at that time. The 58th ARCE meeting in Toledo on April 20-22nd was quite eventful with yours truly giving a lecture entitled �Valley of the Kings Tomb KV-63�, Earl Ertman lecturing on �Use of the Eye with Descending Canthi� and Dr. Zahi Hawass giving the Keynote Address. In attendance from our KV-63/KV-10 staff: Archie Chubb, Earl Ertman, Betty Schneider, Elaine Taylor, Bill Wilson, Roxanne Wilson, and myself along with consultant Salima Ikram. Readers will note that there is now New Donor Information under the �Contributions� Tab. Bill and Nancy Petty have graciously offered to use their 501K resources to administer KV-63 & KV-10 donation funds. Soon....we will have some very exciting news regarding our 2007 Season and impending events. The Donation section of our website is being revised due to some organizational restructuring. As we will need a fair-sized staff and probably several more seasons of work in the field, we do encourage your contributions to cover the excavation and conservation expenses. We simply ask donors and potential contributors to be patient while we reorganize. At this time our proposal and security papers are in the hands of the Supreme Council of Antiquities (SCA). As soon as the SCA issues its rulings we will update everyone on our plans, progress and travel itineraries. We are excited about the upcoming 2007 season and are anxious to return to our work in KV-10 and KV-63. Many thanks for your patience and support. Please check this site frequently for updated donor information. In April, many of the KV-63 staff members will be at the ARCE Annual Meeting in Toledo, we hope to see some of you there. A Special Thanks for all the �Get Well� & �Well-Wishes� emails and letters! On the eve of our One Year Anniversary on the discovery of KV-63 I would like to take this opportunity to bring everyone up to date on recent events and our plans for 2007. After directing the daily operations of KV-63 for seven continuous months in 2006 (without one sick day) I suffered a heart attack in late November, which laid me up in the hospital for a few weeks. I am well, now, but as a result, it has taken time for me to regain my strength and catch up on necessary administrative paperwork concerning our impending KV-63 season. Along with my heart attack, a variety of others factors have led to our decision to delay our 2007 season until this summer. The very long season of 2005-2006 made it practical to shift our normal schedule back a month or so. In addition, both myself and Earl Ertman plan to lecture at the 2007 American Research Center in Egypt (ARCE) Annual meeting in Toledo, Ohio in April 20-22. Currently, the SCA proposal, all reports and necessary paperwork have been completed. We anticipate starting our season in early May and running through August. The late start for 2007 means we will have to work during the hot months, but to our advantage, the bulk of the tasks awaiting us can be carried out inside the relatively cool back rooms of the tomb of Amenmesse (KV-10). The coming season will emphasize restorations and conservation work, plus the examination of the remaining unopened storage jars. Several more seasons will ultimately be needed due to the variety and quantity of the materials from the tomb chamber. Be sure to watch for the most recent "KV63 Update" in the Spring 2007 issue of KMT magazine! Since the closing of KV10 and KV63 on July I6th I have been busy with reports to the SCA and a proposal for the 2007 season which will commence in February or March 2007. Our immediate plans will include continued conservation work on the coffins, exploration of the remaining storage jars, consolidation of various artifacts, and mending of ceramic vessels. The conservation work on the coffins will be a top priority, as we attempt to identify names and texts on the KV63 coffins. ***KV-63 and KV-10 closed for the 2006 season***. Botanists Ahmed Fahmy and Rim Hamdy were out earlier this month to inspect the garlands and floral collars from Coffin �E�, with plans to return again next season. A few of our larger �treasures� were transferred to the Luxor SCA magazine for storage, as they have been registered. Following the installation of an iron gate covering the KV-63 entrance and the clearance of the far corner of the chamber floor (to make sure there were no hidden mummies or tunnels), packing of equipment and securing the crated coffins inside KV-10, both tombs were closed and padlocked on Sunday, July 16th. After a few days of packing up I was on my way to Cairo via train (yes, via train) for a few days of meetings and paperwork before heading home to Chicago at the end of the month. I will be bringing with me the long awaited images of Coffin E floral collars and much, much, more to pass on to our Webmaster, Bill Wilson. Excuse the delay in updating the diary, as events have been very hectic these last few weeks with the clearance of Coffin �E� and preparations for shutting down the site for the season. Coffin �D�, the infant coffin, has been removed from KV-63. The wood coffin is covered in gold, but unfortunately empty. The face and head area appear to be in good condition and elaborately �executed�; but the remainder of the wood is in poor condition due to termite damage. The coffin measures ca. 46 cm in length, thus a bit longer than the gilt coffinette from Coffin �G�. Coffin E --- Many garlands and floral collars appear to be in very good condition, including some with papyrus backing and one with gold interwined. Shortly, a multitude of images displaying Coffin �E� and its contents of exquisite garlands and collars will be posted. In the meantime, a few images have been added on Photo Page 2. We apologize for the delay in posting new images but all photos for the website need prior approval by Dr. Zahi Hawass before posting. On behalf of the 2006 staff, (in alphabetical order) Alistair, Archie, Bill, Betty, Earl, Elaine, George, Heather, Roxanne, Roxie W., Salima and myself, thank you for your support, it has been a wonderful year. At this time, plans for the next season are still pending. The highly acclaimed second Discovery Special �Egypt�s New Tomb Revealed ~ Opening the Coffin� is due to be broadcasted this evening. We sincerely hope you enjoy the climatic end to our exciting discovery this year. The Fall 2006 Issue of Kmt, A Modern Journal of Ancient Egypt will feature a jointly authored article by Earl Ertman, Roxanne Wilson, and myself entitled �Unraveling the Mysteries of KV63�, with expected release date the end of August. Please check back with us very soon�. for NEW photos, before we take a few months off. Feedback from the recent Discovery Special has been very positive. Speaking for the whole team we thank everyone for their sincere encouragement and support. Coffin �C� has been completely cleared. Two long, un-inscribed limestone cornices were found at the head of the coffin along with a miniature bowl, one large storage jar, and some worked stone blocks. Coffins �D� and �F� ~ we are just beginning to examine so a report will be forthcoming soon. Coffin �E� (against the back wall of the chamber) has already received some conservation work. Resin-covered bands of texts are visible stretching across the torso, and extending midline towards the footboard. Intense conservation measures will be utilized to preserve these precious bands of texts in hopes of discovering names or cartouches. In the interim, we are considering x-raying (and other non-intrusive tools) this particular coffin and the infant coffin to determine contents and aid the team in formulating a timetable for examination. The lid and facemask (this face mask is certainly one of the �treasures� of the tomb) from Coffin �F� was removed this week and has already been transferred to KV-10. The interior coffin contained many pottery sherds, natron, chaff, textiles, and six small bowls. The Discovery crew is still filming as the temperatures continue to climb here in the Valley of the Kings. Be on the lookout for the new June/July 2006 issue of "Ancient Egypt" magazine for: An Update on Tomb KV 63 in the Valley of the Kings as staff member Roxanne Wilson details the clearance of KV-63 spanning from February to April 2006. Preliminary Report on the Unique Pillows found in KV-63�s Coffin �G� �.by Textile Specialist Elise van Rooij. Much has been accomplished recently with consolidation of the remaining coffins inside KV-63. Coffin B revealed a large date palm fibre �mat� resting on floor at the head end of the coffin. Conservators Amani Email and Ahmed Baghdady quickly �treated� the mat. As you can see from the enclosed photos the mat is in remarkably good condition. The floor of the coffin, although exhibiting a midline split in the wood, proves to be surprisingly solid and strong. As of now, both side panels and the base of Coffin B have been removed, and the floor swept and sifted of debris. Coffin C has already received preliminary consolidation work by the conservators and clearance should begin mid to late week. Coffin G, the youth coffin, contains several high quality pillows layered on top, just beneath the lid. These �pillows� are finely stitched and stuffed with a �down� material. Textile specialist, Elise Van Rooij from Holland, arrived on Friday to examine the pillows along with textiles found from Coffin B. She will photograph, study, and analyze the pillows before they are removed, hopefully in the next week or so. Needless to say, we are all curious as to the color(s), actual stuffing contents, the consequence on removal (will they expand? ), and what lies underneath the pillows. Be sure to watch for �new� images of the �pillows�, Elise�s examination, and her initial report to be added to the website�.soon. Both Coffin A and Coffin B has yielded an abundance of different types of ceramics including two alabaster jars, 3-4 large storage jars, a �lug� jar, three large red slip �punch-bowl� size vessels, a red/black floral vessel, a black �dotted� rimmed vessel and numerous blue-painted ware (mostly from the end of Coffin B) in various shapes and sizes. Secretary-General Dr. Zahi Hawass paid us a short visit on Wednesday, May 17, where he viewed the remaining coffins (C,D,E,F) and progress of clearing KV-63. The Discovery Channel Special entitled "The New Tomb Revealed" will air on Sunday, June 4th, please check your local listings for times. Also be sure to watch for subsequent special(s), as the Discovery crew is currently filming our latest �finds� for future broadcast. Coffin G (the Youth Coffin) was bought up successfully. The coffin appears very solid and in good condition (no termite damage). The coffin does possess a very exquisite painted face. Of particular interest is the resin-coated underside of the lid, this is indeed unusual, and possibly points to an effort to conceal decoration and/or text. Lid fragments, a side panel, and the mask from Coffin B were also removed from the chamber this week. The inside of Coffin B is filled with pot-sherds (some belonging to large storage jars and blue-painted ceramics), natron, small animal bones, linen, seals (object seals not to be confused with door seals), wood items, and additional funerary goods. By tomorrow, clearing of the interior of Coffin B should be completed and after a day or two of conservation work on the base, the remaining side panel and base should be ready for removal. A new SCA inspector was assigned to the expedition this month from Karnak Temple, he is Abd Ulghani Abd El Rhman. I would like to include a few highlights from Earl Ertman's recent online article with Archaeology. Special thanks to Mark Rose, Executive and Online Editor of Archaeology). One can view the full article by accessing the link on the KV-63 'Links' button located on the left sidebar. Concerning the KV-63 shaft, Ertman noted that it had an overhang similar to two 18th Dynasty tombs, KV-46 and KV-55. KV-46 was the tomb of Yuya and Tjuyu (parents of Queen Tiye, wife of Amenhotep III, and likely mother and grandmother, respectively, of Akhenaten and Tutankhamen). All of the coffins had been coated with a black resin, perhaps to preserve them or obscure inscriptions on them, according to Ertman. It is still possible that a coffin at the back of the chamber, coffin 'E' and the infant coffin 'D' contain mummies. According to Ertman, the shape of the 28 ceramic jars from KV-63 have parallels in finds from KV-46 and KV-54, which was a cache of embalming materials from Tutankhamen's burial. Seals (Objects Seals) from KV-63 have parallels from other tombs according to Ertman. A mud seal depicting a crocodile, lion, and captive is known from Tutankhamen's tomb (KV-62) and KV-55. A seal depicting a seated Osiris is also known from KV-62. Other seals from KV-63 bear the jackal and nine captives, a seal of the royal necropolis. KV-63's shaft overhang, coffins, ceramics, and sealings all point to an 18th Dynasty. Connections with material found in KV-46, 54, 55, and 62 suggest the later part of the 18th Dynasty. 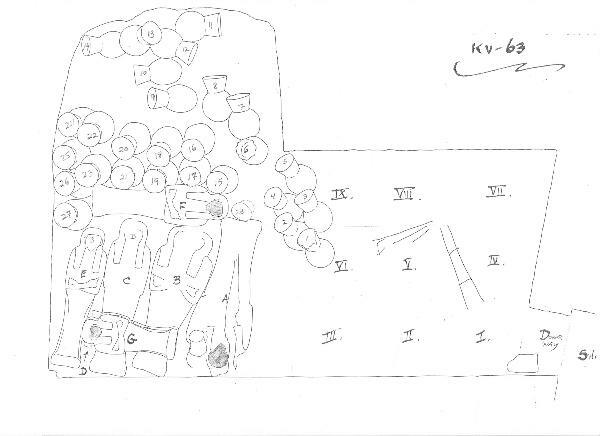 According to Ertman, the top of the shaft, just below the level of a cluster of foundations of 19th Dynasty workers' huts indicates KV-63 was sealed no later than the very beginning of that period. Youth coffin, �G�, is still insitu, but is expected to be transferred out of the chamber tomorrow. Extraditing the youth coffin will have to be performed carefully to avoid potential shifting or collision of the remaining coffins 'B' and 'E'. News on our success will be forthcoming next week, inshallah. Conservation work continues to be time-consuming and meticulous at this stage so unfortunately I have little more to add for this week. However, readers will note the addition of a new �Publications� button on the KV-63 website featuring new and upcoming magazines and journals pertaining to our new discovery. In addition, we will keep you posted on the date of the upcoming Discovery Channel/Atlantic Productions Special on KV-63. Word on the �street� says Discovery Channel is very pleased with the footage thus far. Additional images of KV-63 have been added today, including never before seen photos of our 'newest addition', the infant coffin, labeled 'D' (see the tomb diagram) located on the floor beneath the youth coffin. As the temperatures rise in Luxor and summer advances, most of our work is concentrated inside KV-63 or KV-10. We have halted the removable of the last of the storage jars for lack of space inside KV-10, as the remaining jars do not present an obstacle for the removal of Coffins �A� and �F�. As I believe the time is right, I would like to make mention of the small infant coffin, labeled �D� that some of you previously �picked-up� on from the (revised) tomb diagram. The tiny wood coffin is situated under the head of Coffin �G�. The superior section of the coffin is barely visible but the foot of the coffin juts out near the left ear of Coffin �G�. In the near future, we will post a few images of the infant coffin on the KV-63 website. Filming the small coffin has posed some difficulties due to the tight arrangement of the larger coffins and the difficulty in photographing over the storage jars. It will most likely be May?? before we are able to reach the baby coffin and examine its contents. At this point, we are not certain if the coffin and/or face is painted, decorated or covered in black resin, since it lays flat on the floor, tucked in the shadow of Coffin �G�. 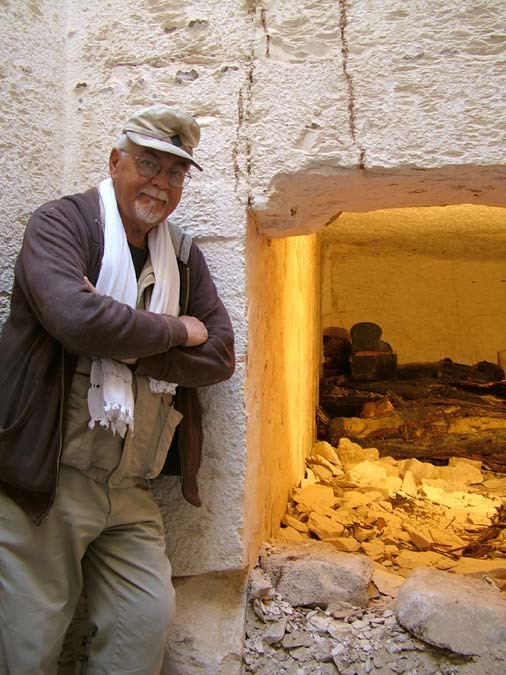 In regards to my absence at this year�s annual ARCE meeting, Professor Earl Ertman has consented to speak on my behalf, Sunday, April 30th at 8:40 AM on the new tomb, KV-63 (in addition to his scheduled lecture later that morning). *This is a last minute arrangement made today and is not listed on earlier programs. As it stands now, I will remain in Luxor, all summer, to oversee the complete clearance of KV-63, as we cannot close the tomb until this is achieved. It is in our best interest to excavate and close KV-63 quickly, before potential rains occur in the valley and so that we can focus on necessary conservation and study of the artifacts. Conservation work on Coffins A and F is proceeding slowly as Nadia Lukma has been in China on business for the past week. This weekend Nadia will return and continue the slow, painstaking process to prepare the coffins for relocation. This procedure involves the application of bonding agents, gentle dismantling of coffin sections, transferring these sections to a custom-made tray and transporting this tray out of the tomb and shaft. Once the coffin sections arrive in KV-10, they are cleaned, repaired, and further applications of special adhesives and preservatives are applied. This process is slow but neccessary for good preservation work. With the temporary slowdown of the conservation work during Nadia's absence, much pot-mending, drawing and cataloging of pottery found in the shaft, chamber, jars, and coffins have been completed. This is all very necessary work, but our main goal for the next couple weeks will be clearing objects from the tomb. In the immediate future, we hope to raise what remains of the bottom (hull) of Coffin 'A', the mask of Coffin 'B' (which is lying face down inside that coffin at present), and finally, we hope to remove the youth's coffin 'G' (see tomb diagram). The Discovery TV Crew has temporarily finished filming but plan on returning in early May for the raising of the youth coffin 'G'. Circumstances have developed to prevent me from lecturing at ARCE as planned. However, Professor Earl Ertman and artist Betty Schneider will be in attendance at the meeting. Lastly, be on the lookout for the May issue of 'KMT, A Modern Journal of Ancient Egypt' magazine for an�exclusive� on KV-63, the new tomb discovery in the Valley of the Kings. Dr. Zahi Hawass and the SCA have graciously made available a team of Egyptian conservators to work on our fragile coffins. Ray Johnson of the Oriental Institute's "Chicago House" has also made specialists available to assist with the work. *Funding for this season has been due to the generosity of the INSTITUTE FOR BIOARCHAEOLOGY and Private Benefactors. Additional KV-63 Tomb News: We hope that the chief conservator Nadia Lukma will return sometime early this month so that the remains of the bottom of the first Coffin 'A' may be removed. No human remains were found in it, but there were several alabaster vessels, fragments of one more large storage jar, several bowls (requiring mending), cloth and natron. After Coffin A is removed to further consolidation into KV-10, we hope that it will soon be possible to take out the youth's coffin which now rests atop the other coffins. ***Sorry for the delay in recent postings as the webmaster has just returned from Egypt. Please stay tuned for a NEW AND IMPROVED KV-63 WEBSITE COMING�.. including a tomb diagram,a map,new postings, images, and links on the latest KV-63 news and discoveries! THE KV-63 STAFF WOULD LIKE TO THANK ALL THE VISITORS THAT HAVE COME BY KV-10 & KV-63 AND FOR ALL YOUR EMAILS AND INQUIRIES (rest assure that all emails are read unfortunately we are unable to answer all emails due to the volume of mail and our facilities). Much as happened in the last two weeks, as Coffin�A� (the first coffin) panel pieces and �mask� were safely raised and relocated into KV-10. In addition, to some large pottery fragments, an inscribed Alabaster Jar and lid was also retrieved from inside the coffin �A�. The Alabaster Jar contained an inscription pertaining to �18 small jars� was examined to disclose resin bandages which may have held moringa oil. A second alabaster jar and lid was also found which indicates �20 jars� and faintly mentions Amen-Re. Ongoing conservation work is proceeding slowly but steadily on Coffin �F� with hopes of transporting the coffin and its �yellow-faced mask� relatively soon. A continual effort has been made to move the remaining storage jars from KV-63. So far, approximately 24 of the 28 storage jars have been raised with 12 of the jars opened and examined. Additional contents, besides the previously mentioned items, include papyrus fragments, mud trays, shells, mud seals, and pieces of twine/rope. As speculation and rumors abound in regards to our tomb containing mummies, well it is still too early to say, for we still have not managed to safely gain access to the rear coffins, such as Coffin C, E, G. *Refer to the newly added tomb diagram for specific coffin and storage jars locations. A Discovery TV crew has been onsite since March 12th filming and interviewing for an upcoming special or specials to be aired starting in June. Please continue to access our website for further details. This coming April, I will be taking a short break from KV-63 to lecture at the Fifty-Seventh Annual American Research Center in Egypt (ARCE) meeting in New Jersey on Saturday, April 29th on Recent Work in KV-63 and Professor Earl Ertman on Sunday, April 30th on Notes on the Decorative Wall Program in the Tomb of King Ay, WV-23, Plus Analysis of a Chryselephantine Fragment Found outside WV-24. I SINCERELY HOPE TO SEE SOME OF YOU IN THE AUDIENCE. A total of twelve storage jars have been removed from KV-63 along with one large alabaster jar. Six of the storage jars have thus far been examined. Contents include natron, wood, seeds, carbon, assorted pottery and small animal bones. Preliminary conservation and stabilization of sections of Coffin-A (the first coffin) has been completed. Panels of Coffin-A have been transferred to KV-10 and preparation in removing the mask and the additional pieces are underway. On March 2nd we began the successful removal of five of the large storage jars and continued with four additional jars on March 4th and one jar on March 5th. The jars vary slightly in size and weight. Salima Ikram is supervising the removal and examination of the contents. Thus far, we have examined only two of the 28 jars, as one additional jar was found under the collapsed footboard of the first coffin. On March 9th, I am scheduled to lecture at the Mummification Museum here in Luxor on KV-63's path to discovery. Clearance of the front of the tomb and a pulley (hoist) mechanism has been completed this week in preparation for the removal of the storage jars and coffins to the pillared hall in KV-10. One of the seven coffins is a smaller youth size coffin with a 'yellow face'. In addition to this we have two other adult size coffins with yellow faces. The remaining coffins are covered in black resin. The storage jars measure ca. 70 cm high. One weighed in at approximately 90-95 pounds. Three of the 27 jars appear to be broken at the rim or lower neck. The lids of most of the jars are sealed or partially sealed. Contents of the jars is still pending examination and investigation. Images of KV-63 will be posted periodically, so please check back soon, inshallah. This past week we have been concentrating on clearing stone and rock from inside the doorway of the tomb before we can safely gain access to the coffins. The wooden anthropoid (human-shaped) coffins currently number seven. Some of the coffins are in poor condition owing to prior termite damage and intrusion (there is no evidence of water damage). At this time no names, titles or dates have been ascertained from the coffins but we do estimate the tomb to date to the late 18th Dynasty. Our goal is to carefully remove the coffins and the large, sealed storage jars (approximately 27) to KV-10 where adequate space will enable a conservation team to thoroughly examine and analyze the coffins and jars in stages. A pulley system is currently being devised to facilitate the safe removal of the coffins and jars from the shaft. A special thanks for all the emails and well wishes. Update information on KV-63 will be delayed until my return to the United States. Further information and photos will be posted pending evaluation. Please see below for instructions regarding donations to our mission and contact information. All emails will be graciously forwarded to me in a timely manner. We appreciate your support and well wishes. 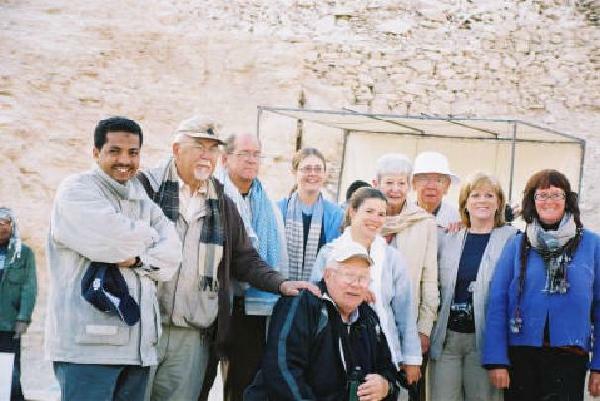 Standing from Left to Right: The Dig Inspector Ezzat Abo Bakr Saber , Dr. Otto Schaden (Director KV10/KV63), Ted Brock, Sharon Nichols (student), (standing slightly in front of Sharon) Heather Alexander (Photographer), Betty Schneider (Artist/Recorder), George Johnson (Photographer), Roxanne Wilson (Artist/Recorder/Web Coordinator), Lorelei Corcoran (UM). Seated is Earl Ertman (Professor Emeritius, The University of Akron, Associate Director of KV-10/KV-63 Mission). Alistair Dickey, Elaine Taylor and Bill Wilson (Webmaster) not pictured.